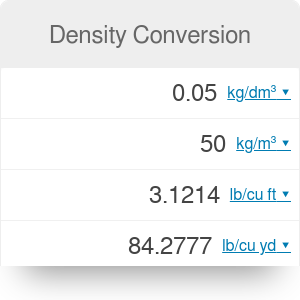 Density conversion tool enables you to quickly calculate the weight to volume ratio in any of the available units. Density itself is a mass of a substance per its volume and it's usually expressed by the Greek letter ρ and expressed in various density units. Density can be measured for any substance and results will vary depending on its temperature, pressure, buoyancy, purity and packaging among others. In general value is relatively small for solids and fluids while it tends to be high for gases. Density of water in lb/gal or, if using metric system, density of water in grams per cubic centimeter can also be calculated using this tool. Similar tool also available on our platform is density calculator. Density equation may be really useful in everyday life. Given the density of a product and its weight in grams, you can easily find its volume. Such form of the equation is handy for kitchen recipes conversion - check out our great grams to cups converter, and recipes from different countries won't be a problem anymore. Density conversion makes it possible to quickly switch between any of these as well as many other density units in real time. Consider trying also our concrete calculator to determine how much cement you need to buy based on the density of concrete mix (and how many elements of a given size are needed, of course). Density of water is a very common topic and a result of many misunderstandings when using different density units. Pounds per gallon are used mostly in the United States but also in several Caribbean and Latin American nations. Density of water in lb/gal depends on its temperature but the relation is not linear. Highest density is observed at around 3.98 degrees Celsius (39.16 degrees Fahrenheit), this is also called "maximum density". The lowest on the other hand happens at 100 degrees Celsius (212 degrees Fahrenheit). Grams per cubic centimeters is one of the standard units used around the world to express density. Thanks to density conversion we can see that it is equal to 1,000 kg/m3 but also 8,345 lb/gal or 0.578 oz/cu in. At 3.98 degrees Celsius (39.16 Fahrenheit) water density is exactly 1 gram per cubic centimeter and drops as the temperature changes. Density Conversion can be embedded on your website to enrich the content you wrote and make it easier for your visitors to understand your message.